Shocking, right? I especially love smoked bacon. It’s easy to make, and I’ll devour a pound of it in one sitting. That’s why when I found out about Pork Belly Burnt Ends, I HAD TO make them. I’ve cooked these a few different times now, and they always turn out delicious. If you love bacon, you’ll love this pork belly burnt end recipe too! When I first got started with my Traeger, burnt ends is one of the meals I really wanted to make. Traditionally, burnt ends are made from the point of a brisket. The point is the portion of the brisket that has a higher amount of fat, and when it’s cubed up and tossed in sauce, it’s delicious. 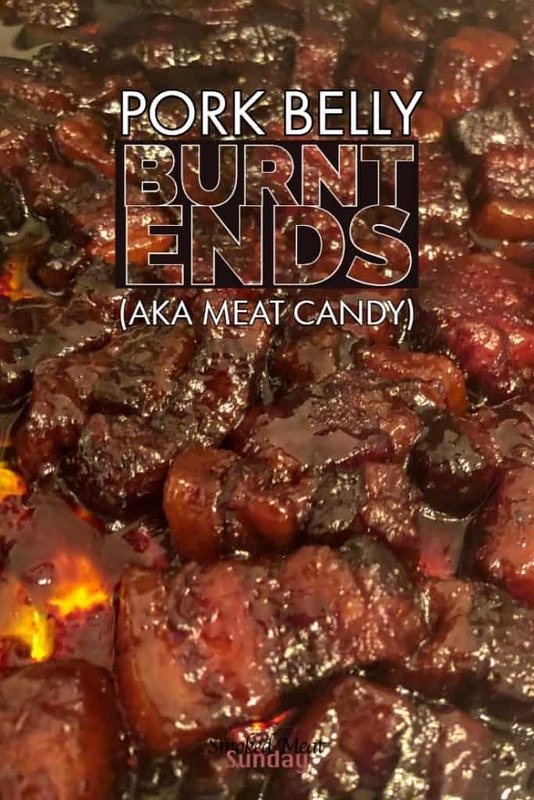 If you’ve never had burnt ends, and your first go is the pork belly burnt end recipe I’m about to share with you, I’m sorry. 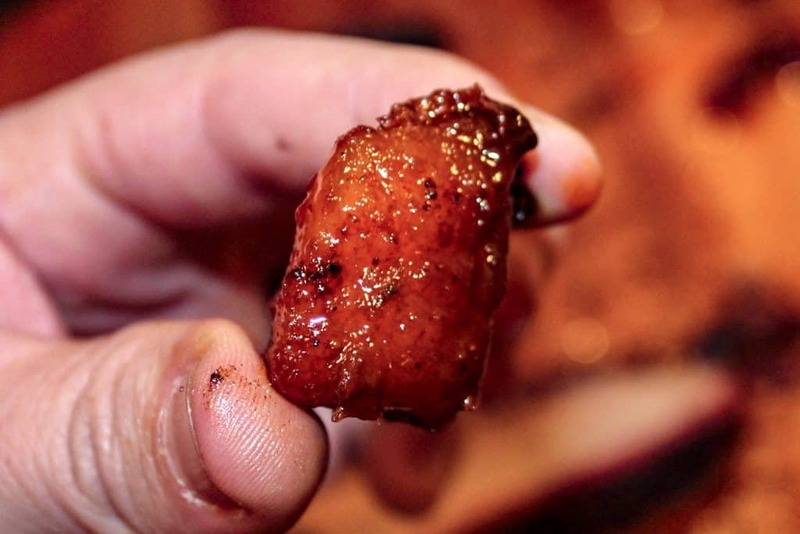 Pork Belly Burnt Ends are WAY BETTER than beef burnt ends. Facts are facts. The first thing you’ll need to get for this recipe is a good slab of pork belly. Most grocery stores don’t have pork belly out on display. Ask the butcher if they have pork belly in the back, and you’ll usually find success. You only need 3-4 pounds of pork belly to make burnt ends, but feel free to get more! You could always use a portion of the pork belly to make your own bacon. Can’t find pork belly locally, or just looking for the best? You can order Kurobuta Pork Belly from Snake River Farms and have it delivered straight to your house! So step one to perfect pork belly burnt ends… order some pork belly! Once you’ve secured your pork belly, you’re ready to get smoking! The first thing you’ll want to do is score the top of the pork belly with a sharp knife. Make the cuts about a 1/4 inch deep. 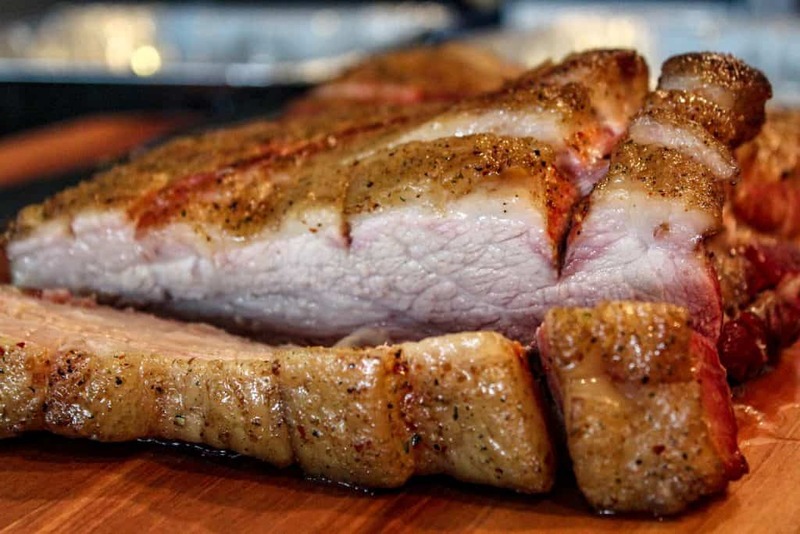 After you’ve scored the top of your pork belly, rub the entire surface with olive oil. You could use mustard if you’d like instead. 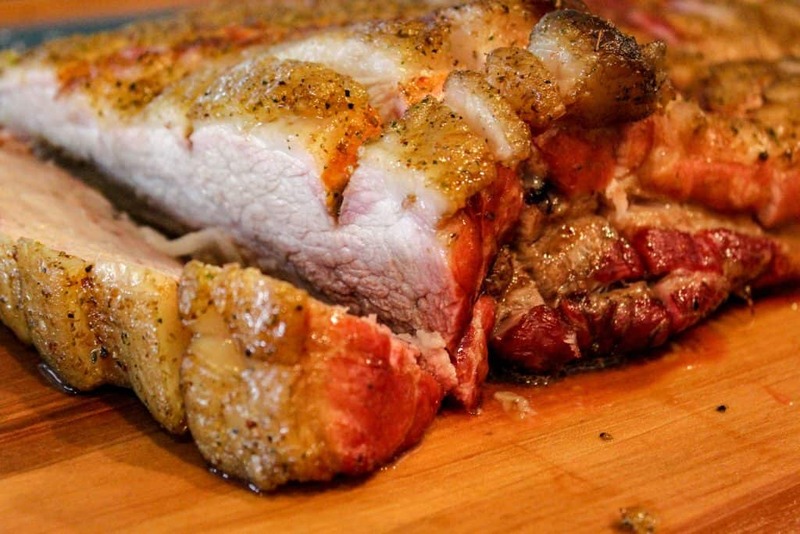 The only purpose of the oil is to help the rub adhere to the surface of the pork belly. Some people put a sweet rub on the surface of their pork belly, but we will add the sweet later. I like to add some savory flavors first. You can use any rub you want, but I’m really digging the Traeger Summer Shandy Rub right now. 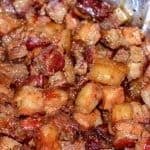 The rub has a lemony flavor that will make these pork belly burnt ends taste different than anything you’ve ever had in the past. Don’t skimp on the rub. You want every inch of the belly to be covered. You’ll lose some of the seasonings as the meat cooks, so it’s really hard to overdo this step. When you’re ready to cook, set your smoker up to cook with indirect heat at 225 degrees. I use pecan or cherry wood for these pork belly burnt ends. If you’re looking for other options, most of the fruit woods will pair well with this recipe. 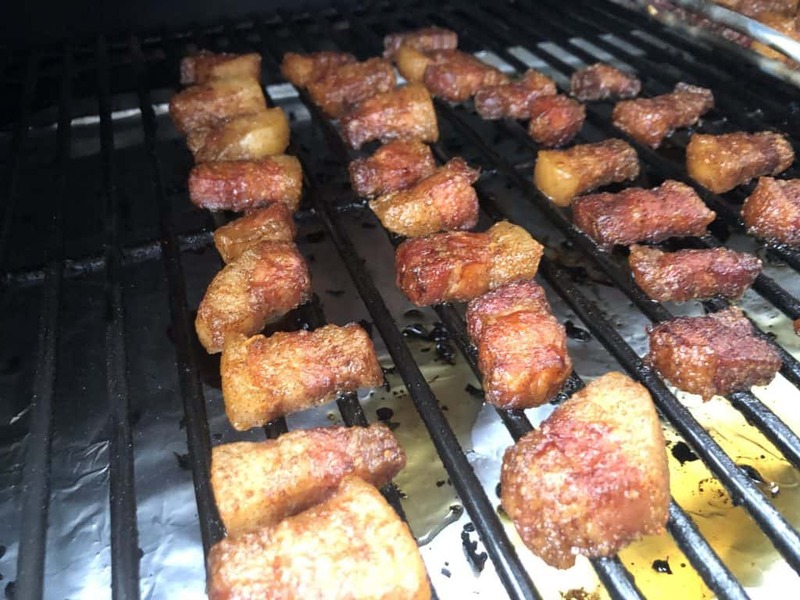 Put your seasoned pork belly on a grill rack, and place it in your smoker. 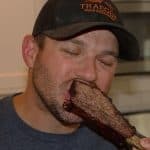 You want to bring the internal temp up to about 165 degrees, which typically takes about 60 minutes per pound of meat. Once the pork belly hits an internal temp of 165 pull it off your smoker, and place the cooked pork belly on a cutting board. Cube the pork belly into 1-inch pieces, and place the cubes in a disposable baking pan. Be sure to pop a few of those cubes in your mouth, and savor that flavor. Seriously, at this point, you could just serve up the pork belly and the masses would be pleased. But believe it or not, we’re going to make it even better. Some people like to cube their pork belly before they smoke it. In fact, I’ve started to prefer this method recently. Cubing the belly first allows you to get more coverage with your rub, and really impart some extra flavor. Now that you’ve cubed up the pork belly, it’s time to add a few ingredients to the pan to help build up your flavor. 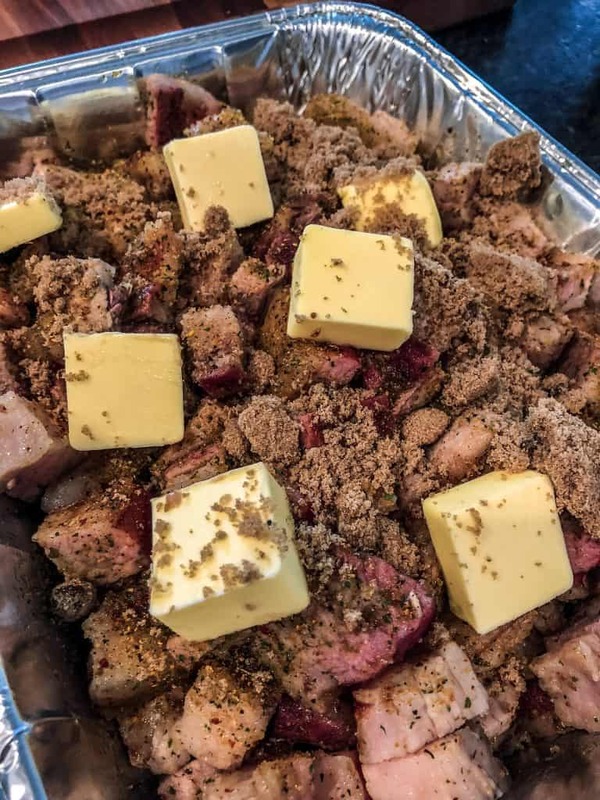 Cube up 8 tablespoons of butter, and place the cubes on top of the burnt ends. Add 1/2 cup of brown sugar, and 1/3 cup of honey. Toss the pork belly in the pan to get all of the pieces evenly coated, and then sprinkle another tablespoon of the rub you used on top of the pork belly. Cover the pan with foil and seal it up tight. Throw it back on the smoker and turn the heat up to 250. Don’t go much higher than 250, because you’ll risk burning, and you don’t want to burn the burnt ends just yet! Check the temp of your burnt ends after an hour or so. You want the temp to get up to about 195 degrees. If you’re there, great! If not, keep cooking until you do get there. When you do get to an internal temp of 195, add a 1/2 cup of your favorite bbq sauce and toss with the pork belly and juices in the pan. Crank the heat up on your smoker to 400 degrees, and let the pork belly cook uncovered for approximately 15 minutes. This will crisp up some of the pork belly cubes, and give it that tacky finish you’re looking for. When the burnt ends are done cooking serve them alongside a good coleslaw and some baked beans. 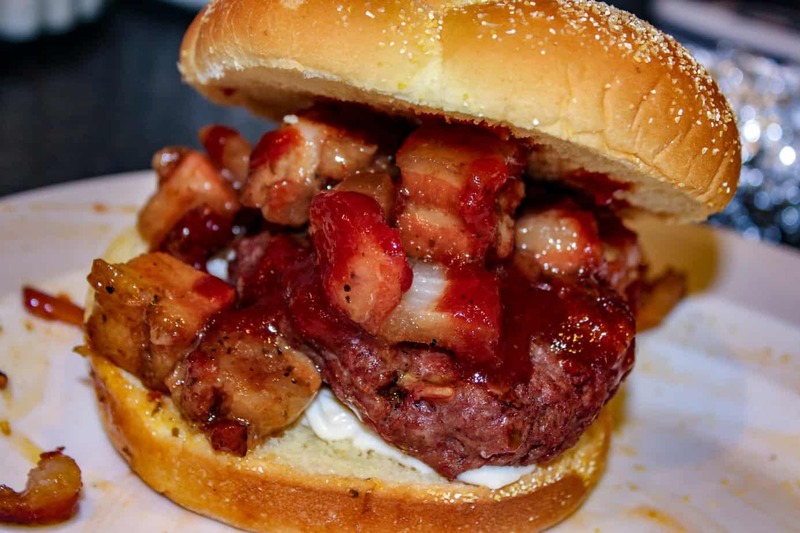 I like eating burnt ends on a good bun, but they are just as delicious plain! 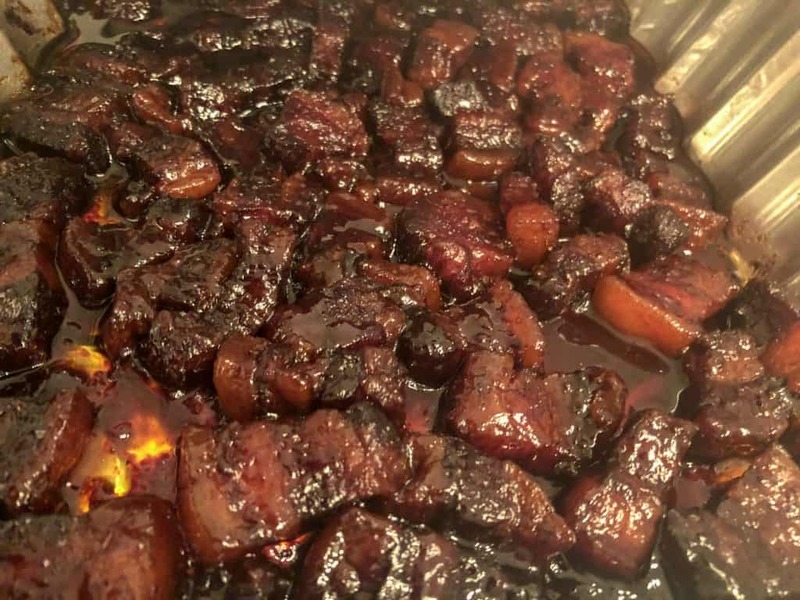 I hope you make the decision to make this pork belly burnt ends recipe one day. They are so incredibly delicious, and way easier to make than I imagined! when I found out about Pork Belly Burnt Ends, I HAD TO make them. I've cooked these a few different times now, and they always turn out delicious. 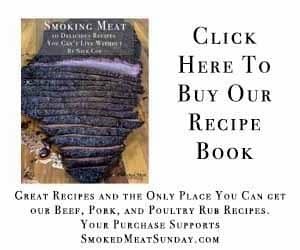 If you love bacon, you'll love this pork belly burnt end recipe too! The first thing you'll want to do is score the top of the pork belly with a sharp knife. Make the cuts about a 1/4 inch deep. Rub the entire surface with olive oil. You could use mustard if you'd like instead. The only purpose of the oil is to help the rub adhere to the surface of the pork belly. Don't skimp on the rub. You want every inch of the belly to be covered. You'll lose some of the seasonings as the meat cooks, so it's really hard to overdo this step. Set your smoker up to cook with indirect heat at 225 degrees. Cube the pork belly into 1-inch pieces, and place the cubes in a disposable baking pan. Cube up 8 tablespoons of butter, and place the cubes on top of the burnt ends. Add 1/2 cup of brown sugar, and 1/3 cup of honey. Toss the pork belly in the pan to get all of the pieces evenly coated, and then sprinkle another tablespoon of the rub you used on top of the pork belly. Cover the pan with foil and seal it up tight. Throw it back on the smoker and turn the heat up to 250. Don't go much higher than 250, because you'll risk burning, and you don't want to burn the burnt ends just yet! Check the temp of your burnt ends after an hour or so. You want the temp to get up to about 195 degrees. If you're there, great! When you do get to an internal temp of 195, add a 1/2 cup of your favorite bbq sauce and toss with the pork belly and juices in the pan. Crank the heat up on your smoker to 400 degrees, and let the pork belly cook uncovered for approximately 15 minutes. This will crisp up some of the pork belly cubes, and give it that tacky finish you're looking for.